Easter Sunday was one super busy day. I spent the whole morning cooking and baking, exhausting BUT it was real fun. We had a friend over for dinner and so it was a mad rush in the morning getting dinner also ready along with lunch but all the effort was worth it as we were able to enjoy a lovely and relaxed evening. I'll soon share the recipe of the mutton stew my hubby made for dinner, it was soooooo good with fresh bread. I'm not a big mutton fan but that stew was awesome. Back to my bread obsession. Like i said earlier, i was determined to crack the bread making code before Passion Week and so since my dear friend Naro Lee told me that the recipe she gave me was an absolute success i gave it a go. My heart and spirit sank to the deepest bottom of the ocean when it turned hard as stone and uncooked inside. I was devastated. Then on re-investigating the steps i realized that my yeast did not froth and so my dough did not double in size and also i did not knead my dough long enough. This time round i used fresh yeast that my MIL picked up for me from the bakery in out area. I actually wanted dry yeast but somehow she ended up getting me fresh yeast. The original recipe called for Active Dry Yeast and so please feel free to use that. Heat 1/4 cup of water in the microwave for 10 seconds, add a teaspoon of honey, stir and then add the yeast. 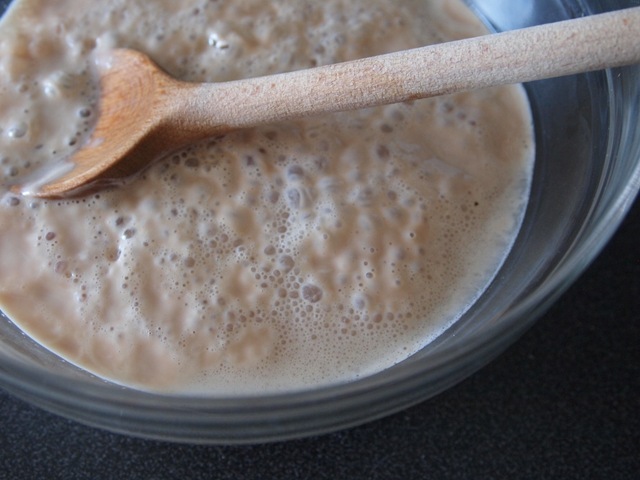 Stir again to mix the yeast with the water and leave it for few minutes till it start to froth. Sieve the flour, salt, and milk powder in a bowl, make a well in the middle and add the frothy-yeasty mixture plus the remaining water and vegetable oil. Using a wooden spoon stir till the dough comes together and comes off from the side of the bowl. Turn out dough on a lightly floured surface and knead it till smooth and stretchy, about 10 minutes (if dough breaks when you pull you need to knead it for longer). Oil a bowl and keep aside.Shape the dough and put the dough into the oiled bowl and cover it with a lid or a towel and let it double in size, for about 1 hour. One doubled, punch the dough down, turn it out into a lightly floured surface and knead for about 1 or 2 minutes. Then divide the dough into 3 equal balls, shape it into ropes of about 10-12 inches long. Now pinch the ropes together on one side and then braid the dough. Pinch the other end also together and tuck it underneath. Oil a baking tray, i used a regular steel plate, and gently place the braided bread onto the tray, cover with a towel and let rise again for another 30 minutes or till doubled in size. Preheat oven at 180 degree C if using microwave-oven or 200 degree C if using regular oven. Whisk the egg yolk with the milk and sugar until combined. Using a pastry brush apply the egg wash over the top of the loaf. Sprinkle whatever topping you wanna use, in this loaf i used oats. Bake in the loaf for 15-16 minutes in a microwave-oven and 25-30 minutes in a regular oven. You know it's done when loaf sounds hollow when tapped. Transfer the loaf into a rack or place it over a tea towel to cool for sometime. Perfect crust n fabulous bake! Stumbled across your blog - the loaf looks very professional!